This is a cloth baseball style hat with a mesh back with the Buckaroo Banzai Banzai Institute logo patch attached to the front. This is a new, never worn hat, available in either blue or black, stored in a smoke and pet free environment. Choose the color you desire or you will receive black. 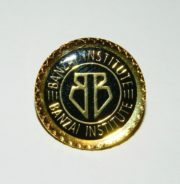 This enamel pin features the logo of Buckeroo’s Banzai Intitute in the cult science fiction movie, Buckaroo Banzai. 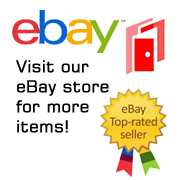 This is a near mint, unused 1″ wide enamel pin. This mint patch is the logo of Buckaroo’s fan club, the Blue Blaze Irregulars, in the cult science fiction movie Buckaroo Banzai. The Banzai patches we are selling were produced many years ago under a restricted fan license that only allowed them to be sold to the comic book, fantasy shop, convention dealer market. This is the logo of Buckaroos’ Jet Car team in the cult movie, ‘Buckaroo Banzai’. This mint patch measures 3″ across. This is a cloth baseball style hat with a mesh back with the Buckaroo Banzai Movie Jet Car logo patch attached to the front. This is a new, never worn hat, available in either blue or black. If you do not choose we will send our choice. This is a cloth baseball style hat with a mesh back with the Buckaroo Banzai name logo patch attached to the front. 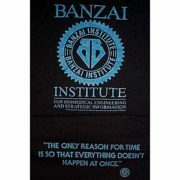 This is a black t-shirt bearing the Banzai Institute Logo on the front in blue, and the phrase from the book “The only reason for time is so that everything doesn’t happen at once.”, on the back, from the cult sci-fi movie “The Adventures of Buckaroo Banzai Across the 8th Dimension”. 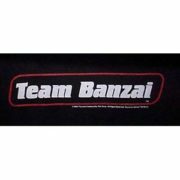 This is a black t-shirt, bearing the Team Banzai emblem on the front, and the memorable phrase from the movie, NO MATTER WHERE YOU GO THERE YOU ARE, on the back, from the hit cult movie “The Adventures of Buckaroo Banzai Across the 8th Dimension”. This enamel pin features the logo of the Yoyodyne Propulsion Systems plant, run by the aliens, in the cult science fiction movie, Buckaroo Banzai. 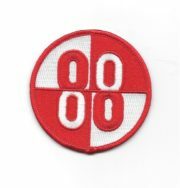 This mint patch is the logo of Buckeroo’s Team Banzai in the cult science fiction movie, Buckaroo Banzai. The Banzai patches we are selling were produced many years ago under a restricted fan license that only allowed them to be sold to the comic book, fantasy shop convention dealer market. For this reason, their distribution was not very good and so are not easy to find today. It has a glue backing for easy application to a cloth surface and is stored in a smoke and pet free environment. This is a cloth baseball style hat with a mesh back with the Buckaroo Banzai Team Banzai logo patch attached to the front. This is a new, never worn hat, available in either blue or black. If you do not choose we will send our choice. This large mint patch is the logo of Buckaroo’s Team Banzai in the cult science fiction movie, Buckaroo Banzai. 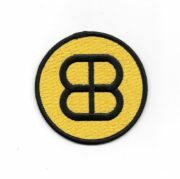 Measuring 2.5″ x 12″ this is a mint jacket patch. 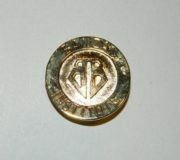 This mint patch, measuring 2″ x 5.5″, is the logo of Buckaroo Banzai’s band the Hong Kong Cavaliers, in the cult science fiction movie Buckaroo Banzai. The Banzai patches we are selling were produced many years ago under a restricted fan license that only allowed them to be sold to the comic book, fantasy shop, convention dealer market. For this reason their distribution was not very good and so are not easy to find today. It has a glue backing for easy application to hats, shirts, jackets and bags and is stored in a smoke and pet free environment. 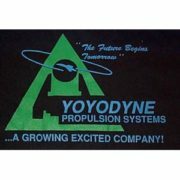 This is a black t-shirt bearing the Yoyodyne Propulsion Systems Corporate Logo on the front, and the memorable quote “LAUGH WHILE YOU CAN MONKEY BOY” on the back, as seen and heard in the hit, cult movie, “The Adventures of Buckaroo Banzai Across the 8th Dimension”. This is a cloth baseball style hat with a mesh back with the Buckaroo Banzai Yoyodyne Propulsion Institute patch attached to the front. This is the logo of the company run by the aliens in the cult movie, ‘Buckaroo Banzai’ and is a mint patch measuring 4.25″ x 3″ across. 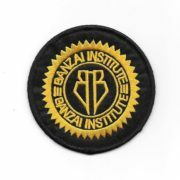 The Banzai patches we are selling were produced many years ago under a restricted fan license that only allowed them to be sold to the comic book, fantasy shop, convention dealer market. For this reason, their distribution was not very good and so are not easy to find today.